A Smart Home is often referred to as an "eHome" or "Smart Living". A Smart Home is a home with interconnected devices, all of which can be monitored and controlled by a smartphone or tablet. Smart Homes are designed to reduce unnecessary power consumption, whilst maximising comfort. Smart Home control plays a major role in Smart Living, allowing heating systems to be controlled anytime, from anywhere, via the internet. Smart Home controls allow settings to be adjusted anytime, to fit with your individual needs. Whether you need hot water for showers in the morning, or want to return to a warm home in the evening, Smart Home systems can be programmed to meet your needs. With Apps available for smartphone or tablet, the system controller and online communications systems available are a great digital solution that offer customisable programmes and complete flexibility. Vaillant helps save energy by using Green iQ products. These products combine the highest energy efficiency and climate-friendly heat generation with smart, internet-based control. In addition, these devices can also be programmed to only provide energy when it's actually needed - offering the potential for high energy-saving. vSMART™ gives you easy access to your heating and hot water information, such as energy consumption, outside and inside temperatures and a status report – meaning you are always in full control. The app has been designed with simplicity and ease of use in mind. There’s even a first time use installation wizard and small questionnaire to help analyse the system usage to define the most efficient heating programme. vSMART™ is an ERP class IV control is an easy and intuitive wirelessly operated thermostat with electronic ink display. 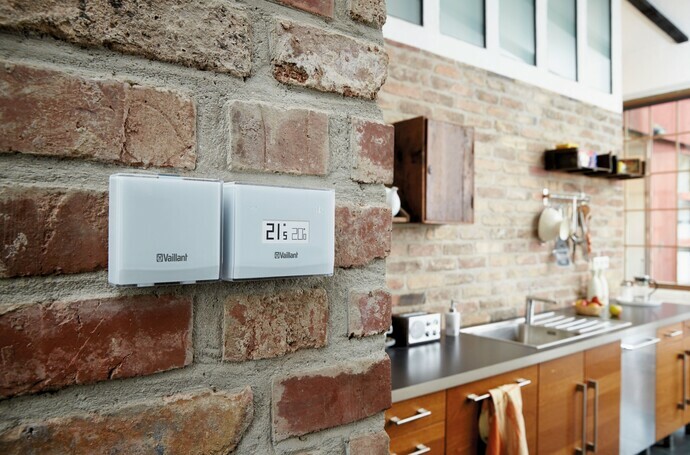 Allowing control of heating and hot water through the Vaillant vSMART™ app. vSMART™ comes with a 2 year manufacturer’s guarantee as standard. Terms and conditions apply. Where can I download the vSMART™app? The Vaillant vSMART™ app is available for both Android and apple devices. You can download the app on your mobile device, or you can search "Vaillant vSMART™ in the apple store or Google Play. What frequency does the vSMART™ communicate on? The vSMART uses 868MHz transmission frequency between the thermostat and the communication unit. The vSMART™ comes with the option to wall mount the control or can be free standing depending on the homeowner's preference. By using the programmable weekly cycle I always have enough hot water for showers - even when I’m working shifts. For me the smart home technology is a real enrichment of my daily life. When I get home, I like it to be warm, but don't want my heating to be in full swing all the time. With my 'Smart Home' App I can comfortably boot up the heating just before leaving my office and know it'll be nice and warm when I arrive. For me, this is a luxury.